Home » Posts Tagged "2006"
The Metropolitan Museum of Art’s Costume Institute exhibition due May 9 to August 11, 2013 is going to make punk hot again. Not that it ever really went away. With buzzed ‘dos already happening, I dread to think how some punk hair cuts will ruin many a lovely face! Fashion is another story. Punk. Chaos to Couture will examine punk’s impact from its birth In the 1970s through its continuing influence on high fashion today. There will be approximately 100 designs for men and women, by all the usual suspects. Original punk garments from the mid-1970s will be juxtaposed with recent, directional fashion showing how pailettes were replaced by safety pins, feathers by razor blades, bugle beads by studs. Presented as an immersive multimedia, multisensory experience, the clothes will be animated with period music videos and soundscaping audio techniques. Organized thematically, gallery sections will include Rebel Heroes, Pavillions of Anarchy and Elegance, Punk Couture, D.I.Y. Style, La Mode Destroy, all organized by my favorite Curator, Andrew Bolton. No news yet on who will create the hair. 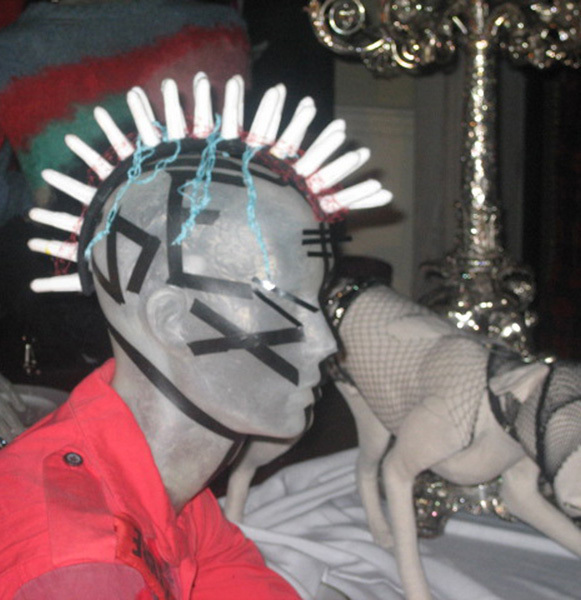 Meanwhile, here’s some punk from the Met Museum’s 2006 Anglo Mania Exhibition with hair concoctions by the great Julien d’Ys to get your inspirational juices going..